Tuesday, after popping over to the LSx Open Cafe (the first time in 5 years of invitations, and well worth finally getting there), it was off to Media City in Salford for the BBC Future Media ‘open evening’. It was a good chance to chat to some of the team who work on some really nice projects such as the new Tivo ‘connected Red Button‘ and the iPlayer apps for various platforms. We also saw some of the tech that’s being developed for multiscreen viewing and some ‘proper’ engineering for sync’ing HD signals over using standard Ethernet connections. They’ve been doing a lot of work about using IP networks for everything, which will cut costs in terms of specialised distribution hardware. They were preparing for the first live trial of the their ‘halfRF‘ project that squeezes HD signals into a tiny bit of RF spectrum making wireless cameras much more viable. For the real geeks out there, there’s some more about halfRF here. 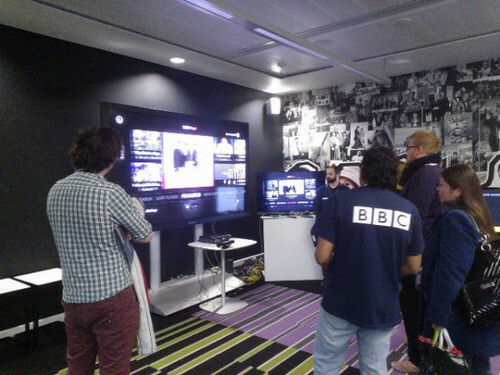 It was also good fun to play with the Xbox Kinect interface to the iPlayer. 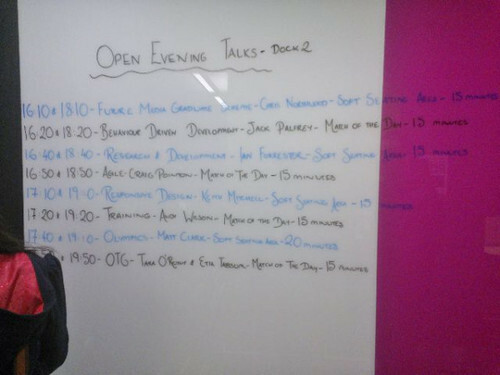 After the demos, there was a chance to attend some talks by some of the staff and developers there. There were some really good sessions,and it was a shame that they overlapped and each one only ran once, which meant missing on some of them. I particularly enjoyed the Behaviour Driven Development from Jack Palfrey and Agile project management from Craig Pointon. Andy Wilson was also there talking about training at the BBC, including the MSc in Software Engineering & Internet Architecture that we’re working on with them, but due to clashes I missed that talk (sorry Andy). All in all, half a day well spent. Looking forward to the next one!